Many travellers start their Tropical Far North Queensland and Cape York adventure from Cairns. There are 2 routes north from Cairns. The Coastal route via Cape Tribulation, the Daintree Rainforest and the Bloomfield Track to Cooktown requires 4WD and is incredibly scenic. This is the only place in Australia where you can experience the splendour of tropical rainforest while being just a stone’s throw from the World Heritage-listed Great Barrier Reef. See the Great Tropical Drive Discovery Trail and Great Tropical Drive Daintree Trail for further information. The Inland route via the fully sealed Mulligan Highway gives the option of turning off at Lakeland towards Laura or continuing to Cooktown from where you can take the 4WD Battlecamp Road on to Laura. Drive from Cairns through World Heritage-listed tropical rainforest out to Mareeba then join the sealed Mulligan Highway north through rolling savannah to Quinkan Country and the 30,000-year-old rock art galleries at the Split Rock sandstone escarpment. Tours to other incredible rock art sites such as the Giant Horse and Mushroom Rock galleries can be booked through the Quinkan Regional and Cultural Centre. Other options include the rock art sites at Jowalbinna about 35 km from Laura. Camp either at Laura or in nearby Lakefield National Park, or alternatively split the journey at Lakeland where there is a caravan park where you can store your caravan. It is approx 310 km from Cairns-Laura and approx 330 km Cairns-Cooktown on the Mulligan Highway route. Explore Queensland’s second largest National Park Lakefield with it’s rivers, lagoons and swamps is a wildlife refuge and home to several threatened species. There is prolific birdlife, and both estuarine and saltwater crocodiles, with plenty of barramundi in the rivers. Recreational fishing is permitted at all camping areas with barramundi and catfish the most common species caught. Permits for camping must be pre booked through Queensland National Parks . 4WD is essential and campers need to be fully self sufficient. There are several scenic campsites in the Park. From the Kalpower Crossing in Lakefield N.P. you can continue for a real adventure out to Cape Melville N.P. and great fishing spots at Bathurst Heads. This is extremely remote so you will need to be fully self sufficient. Drive on from Lakefield to Musgrave’s historic telegraph station. Alternatively you can continue on the Peninsula Development Road up to Musgrave, approx 140km. Stop in at the Hann River Roadhouse for refreshments, 76 km past Laura. The PDR continues for around 100km to the Cape outpost of Coen. There are campsites and basic accommodation in Coen as well as a post office, general store, mechanical services and petrol station. The beautifully restored Heritage House provides a glimpse back to the days gone by and an exhibition of old mining equipment is on display next door to the Heritage House. Visit the Cape York Information Centre and Quarantine Inspection Station 20-km north of the township to find out more about this area. Friendly staff here can offer advice on places to visit and road conditions. About 5km past the Quarantine Station is the turn off for Mungkan Kandju N.P. which is a noted bird watching area. There are several campsites in the Park and access is 4WD only. 66km further along the Peninsula Development Road from Coen, meals, camping and accommodation are available at Archer River Roadhouse as well as facilities for minor mechanical repairs. The PDR continues all the way up to Bramwell Junction but it is worth taking the turn offs to fully appreciate Cape York Peninsula. At the Wenlock River on the PDR, Moreton Telegraph station is a popular campsite. About 35 km north of the Archer River is the turn off to Lockhart River, Portland Roads and Iron Range N.P. The first river crossing is at the Wenlock River and just past this there is a track which leads to the old Batavia goldfields where you can still see some of the old mining equipment. The next river crossing is at the Pascoe River – this is a longer stretch with a sandy bed. The track then leads towards Iron Range N.P. with some spectacular scenery and Australia’s largest area of lowland rainforest. The campsites at Chilli Beach are very popular and there is great bird watching with 15 endemic species, and some interesting walking trails in the Park. Lockhart River is an Aboriginal community famous for the incredible array of artistic talent produced by the Lockhart River Art Gang. A visit to the Arts Centre is a great experience. There is also a supermarket and fuel in the town. The turn off to Weipa is around 50km north of Archer River. The family operated Merluna cattle station is located off the Weipa road and also offers accommodation and camping. From Merluna you can drive to the bauxite mining town of Weipa, with modern facilities and fantastic fishing. This is a good place to stock up on supplies or enjoy the world class fishing. From Bramwell Junction you can either take the challenging Old Telegraph Line 4WD route or the PDR Bypass roads which are maintained to a good standard. The Bypass roads are around 260 km from Bramwell Junction to the Jardine ferry which can take up to 5 hours. Interesting side trips from the Southern Bypass road include the turn off to Captain Billy Landing where there is a campsite. The Old Telegraph Line really starts after Bramwell Junction and continues up to the Jardine River. It is important to have a properly equipped 4WD for this adventurous route but most travellers to the Cape will take the OTL north then return by the bypass roads. Driving north you will need to negotiate several creek crossings, some of which have challenging entry and exit points. Palm Creek is the first crossing, then you face the Ducie River, South Alice Creek and North Alice Creek. After around 30 km from Bramwell Junction you come to the Dulhunty River which is a popular spot to camp. Next is Bertie Creek and after this there is the option of the Gunshot bypass or continue on the OTL to Cholmondely Creek. The infamous Gunshot Creek is the next crossing – this is probably the most challenging crossing on the OTL. Then you continue to Cockatoo Creek, another challenging crossing, and the final creek crossing is the bridge over Sailor Creek. The section from Bramwell Junction to the intersection with the Northern Bypass Road is approx 80 km which can take up to 5 hours depending on conditions. At this junction there is a track to Heathlands Reserve and the lovely Fruit Bat Falls which offers a refreshing swim stop on the way to the campground at Eliot Falls and Twin Falls. The OTL continues from Eliot Falls through the rough Canal Creek, then you face crossings at Sam Creek, Mistake Creek, the aptly named Cannibal Creek, the rickety old bridge over Cypress Creek, Logan Creek and Nolan’s Brook before emerging at the Jardine River. A track then leads back to the Northern Bypass road and the Jardine River ferry. 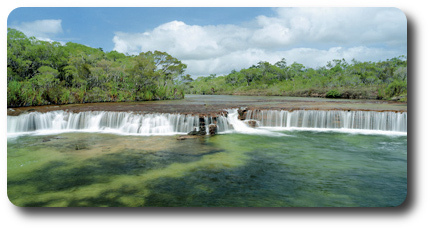 The section from Eliot Falls to the Jardine River is approx 40 km and can take up to 4 hours depending on conditions. Cross the Jardine River by cable ferry and head to the northernmost Tip of Australia. Ferry tickets can be purchased online here. The ferry operates from 08.00-12.00 and then from 13.00 - 17.00, daily in the dry season. Contact the Northern Peninsula Area Regional Council for further information - phone 07 4090 4100. The drive from the Jardine ferry to Bamaga is about 42 km and Seisia is 6km north of Bamaga. There are several camping and accommodation options in Bamaga, Seisia, Loyalty Beach and Punsand Bay with guided tours, hire cars and fishing available within the area. As well as the great fishing there are several WW2 sites, pioneer mining sites and old telegraph memorabilia to visit. Long stretches of deserted beach and the Lockerbie Scrub Rainforest Trail provide good walking options. The historic Somerset beach is another popular site to visit. The Tip of mainland Australia is 32km from Bamaga and 7km north of Lockerbie – the must see destination for all visitors to Cape York Peninsula. Having made it to The Tip spend a few days to enjoy the whole area and why not extend your trip to the Torres Straight Islands. Thursday Island is just 30 km from Cape York Peninsula and easily accessible by ferry from Seisia.